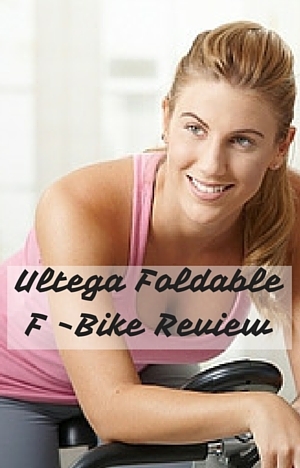 The Ultega Foldable F Bike is a compact folding exercise bike for the home. It is a great space saver as it folds down further for easy storage when not in use. It comes in 4 different styles with different accessories ranging from none to a bike with a towel hanger and mobile phone holder to a bike with a back rest. It can help with choosing a bike that meets your own needs rather than just having make do. It can be adjusted to fit a range of different sizes and has 8 levels of magnetic resistance so it can be used by more than one person easily. It makes this affordable priced bike seem an even better deal when you compare it to cost of the gym and more expensive bikes. However, there are some things to consider when buying to determine if it is the right one for you that are detailed in this review such as the pedal position, the height range and toughness of the workout. The bikes are light at around 40 lbs and the stabilizer bars are narrow which could lead you to think that they would wobble as you use them. That isn’t the experience of users. They hold you firm while you exercise and there are no concerning creaks or squeaks. They do need to be used on a flat surface to prevent rocking. There are no levelers to level out the bike on an uneven floor surface. Putting the bike on rubber mat can help in keeping it steady if there is a little unevenness in the floor. People are surprised in a good way by the build quality of the bike. People who have been using it for more than a year are still getting a good performance from the bike although some have had issues with the console – not working or “eating” batteries. The bike can be adjusted to fit a range of heights between 5 ft 2 ins and 6 ft based on user experience. If over 6 ft tall you will probably feel cramped and not get the full extension of the leg (the knee should be slightly bent at the far end of the pedal stroke. Below 5ft 2 ins you probably are either having to stretch to reach the pedal or not reach it at all at the far point of the pedaling. Making the adjustments to the seat height is straightforward. It adjusts between 31 and 35 ins from the floor. It works with an adjustment knob that you undo and pull out and then slide the seat to the height you want and insert the knob into the preset hole and tighten in place. The adjustment knob is on the underside of the seat pole which does mean you do need to lean down to align the knob with the pre-set hole – it’s more awkward than the usual positioning on the side of the pole like the majority of folding exercise bikes. The speed and ease of adjustment does make it suitable to be used by multiple users looking to improve their fitness. There is little time wasted when you make the adjustments. it doesn’t have markings on the pole. On the white you could mark positions on the pole with a permanent marker to make it easier to set up for each person. The amount of resistance that you push against is controlled by a tension knob just below the handlebars. It is in easy to reach and turn – it turns clockwise to increase resistance and counter-clockwise to decrease. There are 8 levels marked on the knob. Levels 1 – 2 are very light and are almost like there is nothing to push against. If you have joint issues or are rehabbing these levels of resistance can be great for getting started on your journey (of course, checking with your doctor first). Many people have used the bike to do this. Levels 3 – 6 sees an increase in resistance and is where most people exercise at once they’ve built up their fitness. However, if you are looking for exercise that is light to moderate there is enough variation in the resistance to provide this. You can get a sweat on to improve and sustain your cardio fitness, tone up your legs and burn some calories to help with weight loss. At resistance levels 7 – 8 you may find the cycling motion pulse a little as the pedals slow at the top/bottom of the cycle and then speed up as you push on the pedals adding a little impact to the stroke. The resistance is provided by magnets being moved towards and away from a flywheel (all enclosed). As the magnets don’t touch the flywheel the resistance is silent. The transition between the levels happens smoothly, it won’t chop up your pedaling. The bike uses a belt drive to connect the pedals to the flywheel that moves past the magnets for resistance. A belt drive is low maintenance and should last for a number of years. It is quiet too and won’t disturb you like a chain drive does. It’s all enclosed protecting you , pets or kids from the moving parts. The pedals are textured with straps to hold your feet in place. There are designed to be used with athletic type shoes but some people do use bare feet. The pedals are out in front of you rather than below as they are with an upright bike. Most people find the position fine for exercising. You can feel a little more strain on to the glutes and might feel a little awkward at first if you used to an upright bike. The bike is not set up for standing on the pedals as you would a spin bike – there isn’t the room to do it properly and safely. It is best used sitting down and for moderate levels of exercise. Seat. It is a padded and some people find the seat comfortable but others don’t. This is normal for bike seats as it is down to personal preference. The comfort can be helped with a gel seat cover like the Sunlite Cloud-9, Gel Bicycle Seat Cover, for Cruiser or Exercise Bikes (it has been successfully used by customers) or padded bike shorts can help. The seat isn’t the easiest replace because it is fixed to the pole using three bolts rather than the standard bike seat fitting. However, it can be replaced by buying a universal exercise bike seat adapter. When fitted you can choose any standard bike fitting seat. If you are short or have trouble lifting your leg you may have difficulty getting your foot over x-bar as you need to lift your foot over knee height – the green/orange and white models are slightly better as the curve frame gives more room for the foot so you don’t have lift it as high. You may find a step-stool is all that is needed to step-through and on to the seat. Noise. This is a very quiet bike. You can easily hear the TV or hold a conversation while you exercise and workout. You can workout when you want without disturbing even when they are sleeping with some people saying they use the bike in the bedroom while someone is sleeping. This can make it, along with its compact size and being foldable, great to use in an apartment as it is unlikely disturb your neighbors even when on an upper floor. There is no pounding like you get with a treadmill. The only thing that could disturb is a small vibration that might occur or if the bike moves – both of which can be solved with a rubber exercise mat. Dust and Dirt. The bike isn’t going to add much to your chores. It doesn’t generate dirt and dust. However, you do need to keep it clean of sweat (which users mat drop) to keep it in good order as sweat can corrode it over time. You may want to put the bike on a rubber mat to stop sweat from dropping on your floor and damaging it. Handlebars. These can’t be moved but provide a comfortable grip. They are covered to prevent slipping and blisters. You can change your handgrip positioning as you ride if you start get a little uncomfortable – it helps to keep you from tensing up. The bike is compact and doesn’t require much room when in use. It folds down to about half size which makes it able to be stored behind a door or in a closet. It may fit under a bed but it does need between 12- 14 inches of clearance (depending on model). It doesn’t come with wheels to help with transporting. To move it will involve carrying or dragging – it weighs approximately 40 lbs. The manual has clear instructions and diagrams. The tools required to complete the job are included. You are required to add the stabilizer bars, pedals, seat pole, seat, handlebars any accessories and console to the frame. Everything else has been done. The most difficult step is likely to be holding the bike while adding the stabilizer bars and will be much easier with help to avoid any straining or damage. It weight around 40 lbs when assembled. Many do manage to do it on their own so it isn’t essential for there to be two of you. The basic console measures speed (mph/km), distance (m/km), odometer (m/km), calories, time and pulse (when hands on pulse rate sensors). The LCD screen is large enough so you can see the measures clearly except in poor light conditions as they aren’t backlit. You can only see one measure at a time or you can set it to scan through them every 6 seconds. To get a reading for measuring heart rate you need to grip both sensors in the handlebars firmly. It can be hard to get a consistent reading and this is the norm with these types of sensors – they don’t seem to get as good a connection as you get with a heart rate strap. As with most consoles at this price range the measures shouldn’t be relied on as accurate but can be used as a way to track performance and progress. To clear the measures (except odometer) you push the button below the LCD screen. It starts automatically when you start pedaling and will turn off after 4 minutes of inactivity. The odometer is only cleared when you take out the battery. There is a range of 4 bikes that are covered by this product name and they come with different accessories. However, hone of the bikes come with somewhere to place a book or tablet or MP3 player. It is possible to buy a clear tablet/ book holder that fits over the handlebars so you can exercise and occupy your mind at the same time. You won’t be able to see the console when you have a book or tablet on the holder. Nor do the bikes have a water bottle holder. You need to exercise near a table or you can push it in to the frame at the bottom of the X to use as a holder. The manual includes information on stretches for warm up and cool down. There is general guidelines on how hard to exercise (with warnings for people out of shape) and your heart rate zone but doesn’t have give you any example workouts that you could try out. The next grey model bike which is listed as having a max user weight of 286 lbs comes with a towel holder at the back of the seat – nice for grabbing it and wiping the sweat from your brow and the bike. It also has a holder below the tension knob for the TV remote or your phone – saves you from holding it and keeping them handy when you need to use them. The white/orange model has a back rest (which is the difference to the white/green model. This can help with supporting the back and allow you to lean back when you want a change of position. It normally provides a more comfortable ride for everyone and in particular if you’ve back problems. Overall customer reviews are positive. They say how they like that it holds them steady while they exercise. That they can set it to the level of difficulty they want and that it is easy on their joints. They can exercise at home when they want to meet their own fitness goals. There are some concerns expressed with the bike being defective on receipt (occasionally) but the company seems to work with the users to get that sorted. Other concerns has been the pedals being out in front and people not realizing the effect that would have on their pedaling. Also if you are below 5 ft 2 ins in height you will find it difficult to reach the pedals and that is not detailed in the listing. There are 4 bikes listed in the range that have different set up with different prices. They do differ in what they offer – it’s not just down to the color. The cheapest and most popular is the grey bike (220 lbs weight limit) that doesn’t offer any accessories, next up is the grey bike with a max user weight of 286 lbs plus towel hanger at the back and somewhere to store the TV remote. Then there is the white/green model which has a more curved body with more vertical handlebars with more modern looking console (it is priced slightly below the grey bike (286 lbs weight limit) . The most expensive bike is the white/orange bike which comes with a back rest but otherwise looks to be the same as the white/green model. It is only available for Amazon when I checked. It qualified for free shipping and Prime at the time. This is a good solid bike to get light to moderate exercise. It’s ideal for all homes but makes a good choice for apartments and small homes due to its compact size and that it can be folded up for storage. The four models are all affordably priced and do come with different options to help match a bike to your needs. They do come at 4 different price levels to reflect that, so do check that when deciding on the model for you. It isn’t for people who want demanding intense workouts or to do spinning style workouts – it isn’t designed for that with the pedals out in front making. If you are looking for an affordable bike that doesn’t take up much room this is a good option. It provides a stable base, appears durable for those wanting light to moderate low impact exercise to get in shape, stay in shape and/or burn calories for weight loss.